There I was standing, before the man of my dreams. Yet, unbeknownst to me, this man is transgender and ready to love me regardless of the obstacles ahead of us. I reminisce on the first time I was introduced to Luckie: I was in Oakland, CA, at a national transgender advocacy conference. He was introduced to me as a friend, yet my mind was instantly thinking about being in his life. After I held a conversation with this mysterious man, I returned to my room and daydreamed about him. Once I received word that this mysterious man was trans as well, I began to ask myself questions. Was I? Could I? Should I? My mind was puzzled! I was curious, very curious! So, I watch him all that night to see how he mobilizes through our trans community. Once I noticed the night winding down, I knew I had to make a move. I rushed to my room and waited on him to come down the hall. So now I’m thinking it’s now or never and Luckie is coming down the hall I step outside the room with my bust pushed up to my chin and I seductively said, ”do you mind unzipping my dress?” Of course, he was a gentleman and helped me out. Yet, he didn’t see my advances on him. I gave him my best eyes and seduction and he didn’t even realize I was on the planet. So, I just accepted the fact that he wasn’t into black girls like me. He didn’t like southern girls like me with a country accent is what I told myself. Time passes by and so do we. I saw Luckie frequently at local meetings and events. Through our advocacy we entered the Mr. & Miss Quest 2018 pageant and it must have been fate because we saw each other every weekend. Throughout the pageant process, I stayed sick and Luckie kept contact. So, the night of the pageant I was more sick than I could handle but I wanted to fulfill my duties and win my title that some people said I couldn’t obtain. The whole entire night I was sick and throwing up. I hid my pain and sickness together and endured the pain I was having in my legs and feet. I had everyone fooled I thought, except Luckie. I still remember like it was yesterday that he came to me that night and said, “how are you beautiful?” I was everything but beautiful that night, at least that’s how I felt. He said, ”are you ok? you look a little ill.” I responded so delicately, “yes, but I’m going to the hospital immediately after this.“ Luckie told me that he would come visit. So, minutes later I was winning the title of Miss Quest 2018. So now we are Mr. and Mrs. Quest and ready to advocate for the world. Just like Luckie said, he came to see me right after the near-death surgery of my appendectomy. And he surprised me with stuffed animals and chocolates. I was so grateful because I had just moved here from Mississippi and had no real friends or family. But Luckie made sure he came to see me, proving he was a man of his word. I didn’t realize it, but me being trans and HIV+ didn’t seem to be a hurdle for him. We definitely were getting to know each other and becoming closer as Luckie continued to keep his word by coming to see me. Two hours on the bus, coming and going back, he spent most days coming to see me. Then the days turned into nights. And the friendship turned into a relationship that neither one of us were ready for. I asked Luckie to hold me one night at the hospital. Once he held me I completely fell in love. It felt so right. If it was wrong I didn’t want to be right, I wanted to be Luckie’s girl. After that night it was Christmas day, and I was waiting on Luckie to come see me and just like clockwork he showed up. We made it official! I informed him that I was HIV+ and proud. His response was one I had received before, but he was first to actually to tell me he wanted to get on PrEP and for us to move forward in life. He concentrated on getting to know me for me and not worry about the stigma placed on him for just being around me. For three weeks, he made sure I was ok and loved. He handled it like a man should. I was concerned with the fact that we are both transgender and the internal stigma was taking over me. My thought process made me feel so apprehensive and disconnected from him until I had a conversation with myself. My self- reflection was internalized stigma and I asked myself, ”do body parts define gender? What defines a man for me?” I had an understanding with myself and the reality is, it was a big double-standard. It was ok for me to be trans and be considered as a woman, yet I wasn’t reciprocating that same mindset or consideration for the trans male population. A population I didn’t know existed in its own marginalized communities. Luckie bathed me, fed me, helped me use the bathroom, and made sure I was treated with respect and dignity. And for me, that was being a man! Matter of fact, he’s the best man I’ve been with. No more did I concentrate on men who only wanted me in the shadows and in the midnight hour. Luckie was teaching me that as a HIV+ trans woman of color I deserve to be loved and treated with respect. We have been very successful with PrEP In our lives, it’s helped us maintain Luckie’s HIV- status. I hope by sharing our different love paths to each other, we can inform the community that love has no fear when it’s love leading the way. Professionally, Jazielle is a Licensed Practical Nurse and has received two Associates degrees from Virginia College in Administrative CMA and Pharmacy Technology, as well as a list of healthcare-related professional certifications. Since her prison departure, she has been affiliated with the ACLU, HRC, Greater Than AIDS, Positively Trans, as well as many other social justice agencies. Currently, she is the Intake Coordinator for the Transgender Health Program at St. John’s Well Child and Family Center in South Central Los Angeles. 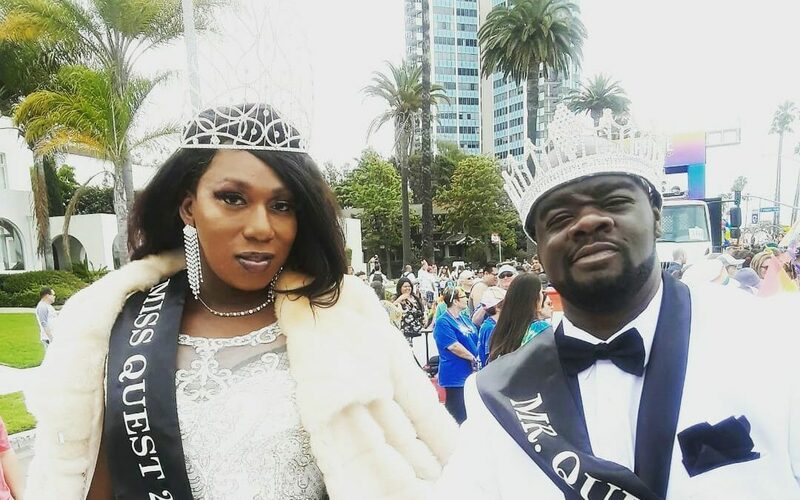 As the newly crowned Miss Quest 2018, she is ready for the fight for equality, encouragement, and advancement for the transgender and gender non-conforming community. Jaz! This is amazing. Thank you so much for sharing your story. You both look FABULOUS in that pic. Much love to you. Jaz you know I love you gal! And you are so lucky to have Luckie! Blessings to you both on this part of the journey!